The idea of pressure canning can be an anxious one for new food preservers. The equipment may be unfamiliar and if you aren't careful, you can end up with mason jars of food unsafe to eat. Safety guidelines should be followed and respected, but do not be afraid of the time-tested technology that is pressure cooking and canning. In the 1870's pressure canners used in private kitchens were redesigned for safety. Before the 1970's canners were heavy metal pots with less reliable safety features. Today's pressure canners are generally more lightweight and built with safety in mind. Today's pressure cookers have safety measures to prevent an unsafe build-up of pressure that made pressure cookers of yesteryear disappear. Once you have a pressure cooker you might find yourself dining out less often, saving money and gas. Your stove will run for minutes, not hours. The kitchen stays cooler, reducing the need for air conditioning. But the unbeatable flavor is the most convincing argument, whether your cooking a meal to eat for dinner or preserving a colorful garden harvest, you can't buy this taste. According to the Rocky Mountain Institute using a pressure cooker cuts stove top energy use by 50-75 percent. Purchasing a pressure cooker comes with a variety of choices. There are three important considerations to help you decide which pressure cooker/canner is right for you. If you've got more questions, we're here to help. The most popular pressure cooking brands are Mirrro, Presto, All-American and Maid of Honor. All of the cookers and canners available (with one exception) have a twist-on lid that seals with a gasket or "rubber" inside the lid. This gasket should be replaced periodically to achieve a reliable and tight pressure seal. The All-American Pressure Canner does not have a rubber gasket. This cooker features a metal-to-metal seal employed by simple screw knobs that fasten the lid tightly to the kettle. The All-American Canner is regarded as the Cadillac of pressure canners - industrious for canning large harvests and never needing a replacement gasket. It's the only brand that's still made in the United States. They have two automatic venting features and will last several generations. It is made with heavy cast Aluminum and thus is larger and heavier than their gasket-requiring counterparts. We donated our most popular 921 size to doctors in Haiti two years ago to sterilize medical equipment. Presto and Mirro are the other two most popular brands. Mirro Pressure cookers were our grandparent's favorite. Mirro cookers and canners are only made with aluminum metal. 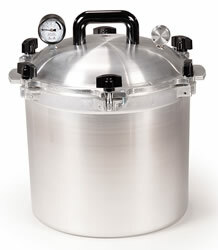 In fact, all pressure canners (those larger than 16 quarts) are aluminum - it conducts heat more effectively. If you're planning to cook meals in your (probably much smaller) cooker - stainless steel tends to impact flavor less than aluminum, but the difference is subjective. The Mirro company name has been around forever but their replacement parts - especially for older models - have not been as readily available. If you're looking to snag a deal on a used canner make sure you check for replacement part availability. If you purchase a Mirro from us, we carry the current replacement parts and many from the past. Presto pressure cookers are made both in aluminum and stainless steel. In our 15 year experience, we've kept presto replacement parts available even for some of the oldest models. 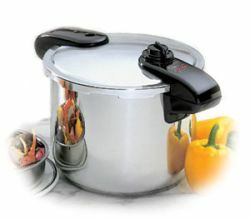 The Presto Professional Pressure Cooker 8 Quart Stainless Steel model featuring handles on each side of the pot. This biggest personal question is whether you prefer a weighted or dial gauge. Weighted gauges allow pressure to reach 5, 10 and 15 lbs and it is maintained by releasing tiny bits of air and steam each time it jiggles. The weighted pressure gauge was designed so not to require constant watching - the sound indicates proper pressure control. The dial gauge displays the amount of pressure and temperature in the canner. You have more flexibility with a dial gauge but it must be watched and regulated to maintain desired pressure. Gauges can be checked at our store, if you live on the east coast in Virginia or North Carolina. Modern pressure canners have removable racks, an automatic vent/cover lock, a vent pipe (steam vent), and a safety plug. Use only canners that have the Underwriter’s Laboratory (UL) approval to ensure their safety (all of ours do). Pressure cookers can often be found for a steal at yard sales and flea markets. If it's not new, be sure to have them tested for safety. When choosing a pressure cooker to invest in, check the availability of replacement parts. If you can find a local store or small Online business that reliably carries replacement canner parts (yep, we do that and we'd really appreciate your business so we can serve and fuel your pressure cooking and canning needs). Make the investment in a pressure cooker by funding the businesses that know what they're talking about and are happy to answer any question as long as they stay in business - even if they (we) can't afford to ship for free like big companies do without proving adequate customer service. When ordering parts, you'll need to give your canner model number (on the bottom of the pot).